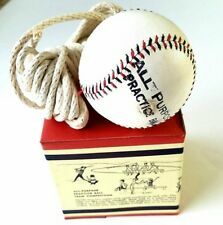 Vintage 1960s Wilson Official Leather Baseball A1099 Brand New in Box NOS. Nice Scarce Original Collectible Piece From a Local Estate Non Smoking Home. VINTAGE 1950's J DeBeer and Son No AA Official League Baseball, NICE!! You are purchasing a VERY COOL circa 1950's/1960's J. DeBeer and Son model No AA Official League baseball. Ball is regulation size. Ball has No. Cushioned Cork Center on bottom panel and has Official League Ball on sweet spot. The clean smooth wool base ball hat cap is in very clean soft condition/clean Contd. and is fully intact and very clean (see close up photos). LL-9 Orig Box. I have 10 for sale. Each is NOS - unused in amazing condition. The boxes are not as great from storage and age. See pictures for best details. BALL IS IN NEARMINT CONDITION. YOU GET THE ACTUAL ITEM SHOWN. Catalog No. 52596F. Rochester MI, 48307. From the late 1800's to current product we can use it all! For larger deals we will travel to you. WE WILL BUY IT! We will not declare as a gift. If this happens it is simply an oversight and we will gladly correct the error. The interior leather lining encompasses the entire interior of this old beaut and is in unused minty shape and is complete and tightly sewn - in minty solid and in great shape. The clean smooth wool base ball hat cap is in very clean soft condition and is fully intact and very clean (see close up photos). The Ted Williams indorsed products were sold throughout the 1960’s - 1970s. The line of Ted Williams "Certified and Approved" Baseballs included Major League Specifications, Official Little League approved, and Official League Softball. EARLY 1960S CIRCA BASEBALL BOX. BOX EMPTY . You get two baseballs of each league. These are sealed, NEVER opened. This Reach No. It dates to the 1960's and has never been opened. This was a souvenir you could by at Candle Stick Park. Size: 3" x 3" x 3", Sears (1960s) - WH. Ted WIlliams Official Little League Baseball. This # is text enabled as well. IT IS IN FAIR CONDITION AT BEST - SUPER RARE! - A STEAL FOR THE PRICE! PRESIDENT'S STAMP : Joseph Cronin. See photos for further details. BALL MANUFACTURER : Reach. BALL PRODUCTION DATES : 1960-69. I received this ball as a gift when I was a kid in the 90s, all I remember is I was not allowed to play with it. I do not know enough about baseball sports memorabilia or autographs to know how to go about authenticating it. I know there are services that can, but I don't even know where to start. So I am selling it as is and I make no guarantees about it. I spent a few hours comparing it to known genuine signatures and it looks genuine to me. It does not look like the known fakes out there, and it is on the correct Gene A. Budig American League ball that matches the genuine examples. If you have any questions or would like to point me in the right direction please let me know. The ball is clean and in excellent condition, it comes in a plastic protective case. This is Harwood's OFFICIAL LITTLE LEAGUE #HLL nine (9) in. five (5) ozHORSEHIDE COVER CUSHIONED CORK CENTER baseball. M ade by H. Harwood & Sons, Inc. Natick, Mass. HLL cushioned cork center. Box is in only Fair to Good condition. Gillette World Series Baseball 1960s Vintage. This was a special mail order only offer from 1964-1966 to get a baseball manufactured by Wilson Sporting Goods which had facsimile autographs of many famous major league stars of the day. Signatures included Willie Mays, Jim OToole, Juan Marichal, Ernie Banks to name a few. The baseball is still in its original plastic wrapping which has caused some of the signature blue ink to run some but all signatures are clear to read. Comes with the original 3 panel additional offer included with each baseball and in original box. Great piece. Buyer pays $7.00 shipping. This ball has a couple a marks on it. The coloring is a slight yellow but not much. This ball is full of signatures with none of them being authenticated. Box here with the old whiffle ball in it from the 60's. Pictured is a young Pete Rose. Great display piece! Some wear but displays well. PRESIDENT'S STAMP: Dewey Soriano. BALL TYPE: Official Pacific Coast League. BIO: Franklin Delano Roosevelt Wieand was born in 1933 in Walnutport, PA. He played major league baseball from 1958 to 1960 as pitcher for the Cincinnati Reds. I BELIEVE IT TO BE FROM THE 1960's OR 1970's. IT IS IN GOOD CONDITION FOR IT'S AGE BUT DOES SHOW TONING/MARKS AS IS TO BE EXPECTED. 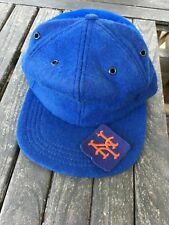 The clean smooth wool base ball hat cap is in very clean soft SMOOTH clean condition and is fully intact and very clean (see close up photos). PRESIDENT'S STAMP : Dewey Soriano. BIO : Franklin Delano Roosevelt Wieand was born in 1933 in Walnutport, PA. He played major league baseball from 1958 to 1960 as pitcher for the Cincinnati Reds. BALL TYPE : Official Pacific Coast League. This International League ball is in wonderful condition with only a light "smudge" on one panel. It has the signature of George Sisler Jr. who was the president of the Internation League from 1966 to 1976. B76C, Approved by Little League. Both Balls are in Mint condition. & Display Great! Horse Hide Cover. Cushioned Cork Center. from the 1960's. Top of both Boxes are marked: June 24, 1967. Ball is in excellent condition. Ron Santo All Star Baseball from Wilson. Shipped with USPS Parcel Select Ground. It is a stamped baseball most likely sold at Cooperstown in the 1960s. Look the pictures and you can see this ball is pretty white with very little yellowing. Here are two Worth LL-100 Little League baseballs. Original boxes are included, and paper wrap around baseballs. Boxes have been opened, but baseballs have not been used. These were obtained at an estate sale.